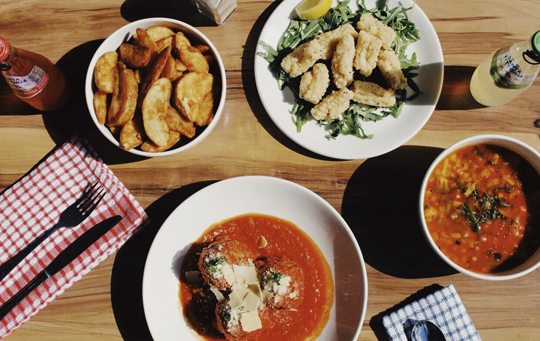 In the mood for an Italian feast? Order pizzas pastas, meat, seafood dishes, and desserts from a La Porchetta restaurant near you. Get La Porchetta delivered to your door! The vision of Italian born Rocky Pantaleo and Felice Nania, the first La Porchetta Restaurant was opened in 1985, in a run-down pizza shop in Melbourne’s Italian hub. Soon after, news of La Porchetta’s amazing pizza, pasta and Italian-style menu, spread rapidly, establishing itself as a special place to experience good food, love and a passion for life. With La Porchetta’s reputation of celebrating delicious food made from fresh ingredients, warm service, great value and a family heart, more franchises opened and can now be found in 43 locations in Australia and 5 locations in New Zealand. Central to La Porchetta’s food, is ensuring the Italian traditions to honour ancestors is respected; from the preparation of the authentic recipes, the warm welcome shown to each customer and the respect given to every employee. Their vast menu uses only the freshest and highest quality ingredients to make their famous pizzas and pastas, meat, poultry, and seafood dishes, and of course sweet desserts. Let’s face it, if you haven’t got an Italian Nonna preparing for you authentic, family-based recipes, then the next best thing is to order in your favourite Italian meals from La Porchetta. In just a few, easy steps, you can order an Italian feast through Menulog to enjoy in your home. Buon appetito.